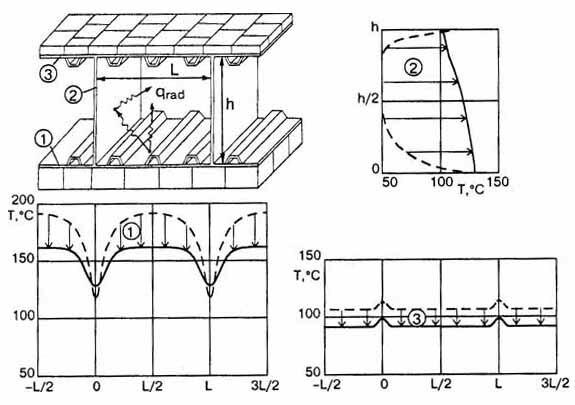 The worked out technique for the creation of the thermal tiles and their physicomechanical characteristics are higher than their foreign counterparts. 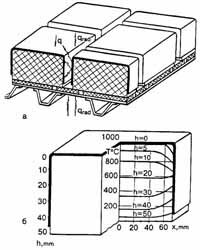 The design features of the tiles were: a great recurrence of use (100 cycles), important variations in temperatures (150°C to 1650°C), low coefficient of thermal conductibility 0.06 W/(m*K) at 100°C, 0.12 W/(m*K) at 1100°C, a coefficient dilation of 7/10000000 and a density lower than 0.15 g/cm3. So that the tiles offer a high strength to the thermal loads it was necessary to use pure matters, the concentration of impurities was to be minimal (particularly into alkaline and alkaline-earth). The concentration of the silicon dioxide was 99.9% what ensured the stability crystallization of amorphous oxide and allowed the guarantee of the materials properties. 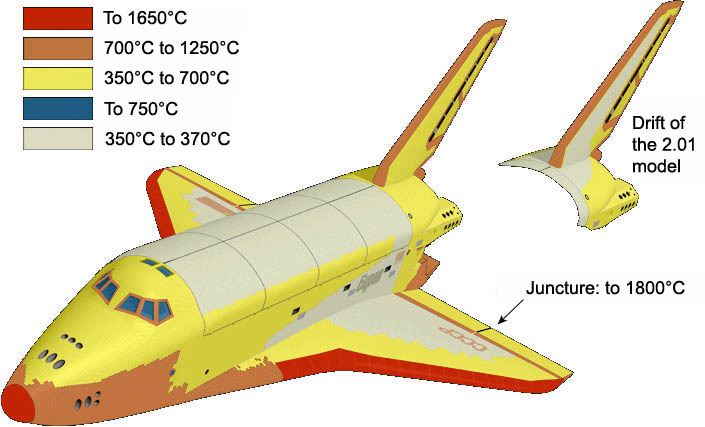 The tiles are positioned on all the surface of the shuttle with a play which takes into account the shield deformation due to the increase of temperature and the differences in mechanical loads during the flight. This play does not exceed 0.3 to 0.5 mm to allow a harmonious flow of the hot air. Space between certain tiles is sometimes filled by sheets containing quartz fibre. The tiles of black color (more resistant) are positioned on the lower part of the shuttle and hot parts, while the white tiles, which limit the irradiation caused by the sun, are installed on all the remainder. The analysis of the matters and the determination thickness of the tiles were made according to mathematical models. 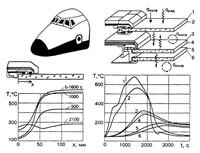 Moreover, several external parameters were taken into account such as the v conditions, radiations, the convection of heat inside the aerofoil, the plays between the tiles, as well as other factors. The influence of the plays between the tiles is of primary importance because it can reduce the efficacy of the shield considerably (see diagram on the right), this is why this parameter was carefully controlled during all the phases of the manufacture and the exploitation of the shuttle. 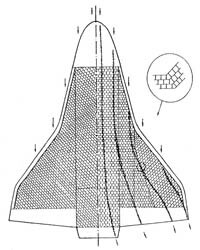 The structure of the aerofoil is not made of a block but contains interior cavities. 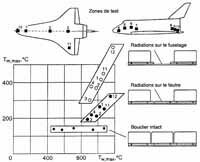 These last make it possible to reduce the thickness of the heat shield, on the other hand heat is transmitted along the strengthening pieces (as you can see it on the diagram) and decreases its effectiveness. The diagram of the right side shows the temperature evolution of the leading edge of the wing during the time. 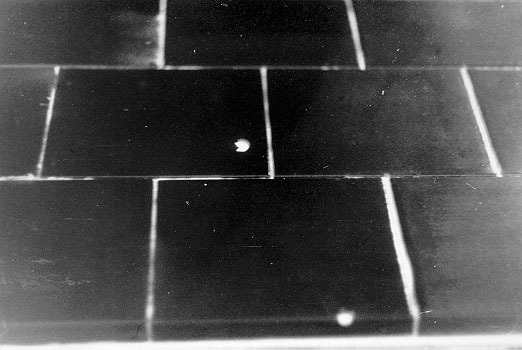 It is seen that the use of a heat shield containing carbon makes it possible to reduce the temperature of more than 1150°C compared to the external environment. The main problem of using a shield made up of tiles is the loss of one of them. 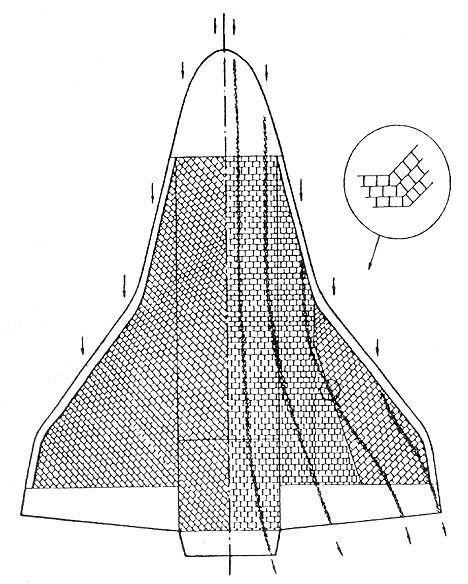 The studies made on the test shuttle concluded that the damage or the loss of some tiles would not involve the fusion of the structure of the aerofoil, and thus the destruction of the shuttle. 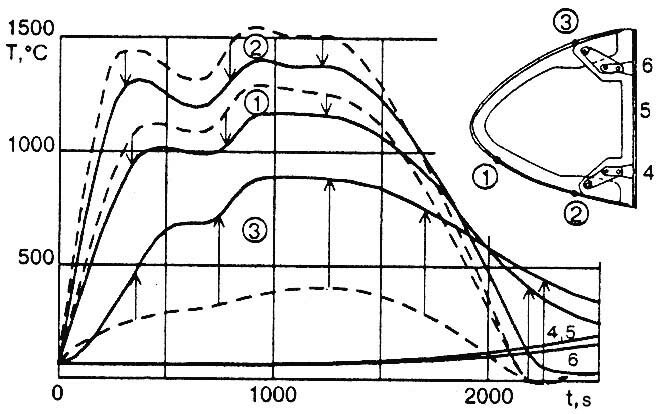 This problem is illustrated on the diagram where different scénarii are studied, change of the temperature of the aerofoil according to: the loss of a tile, the loss of a tile and the felt. 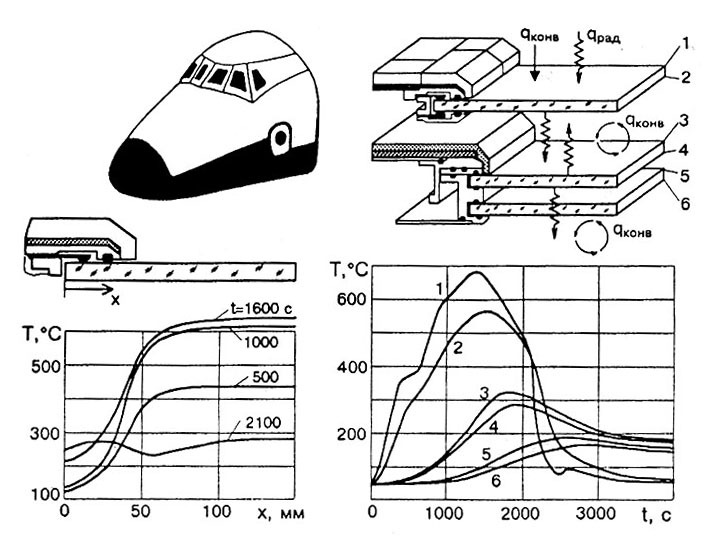 (Tm temperature of the aerofoil, Tw temperature of the plasma). The tile positioning on Buran is different from the American shuttle. 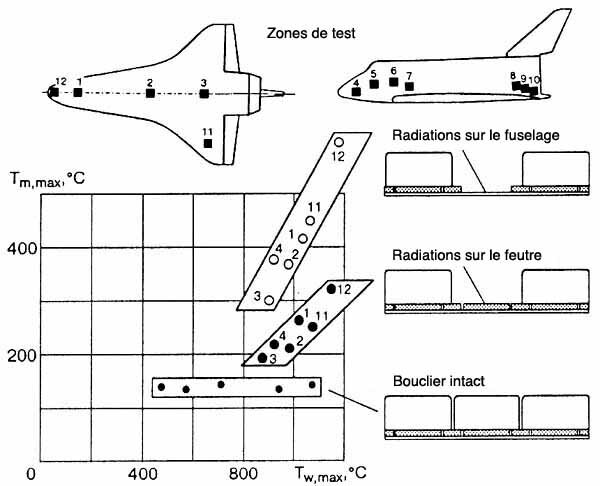 On Buran there are no triangular and acute-angled tiles, and all the long slits between the tiles are perpendicular to the plasma flow (see opposite figure). 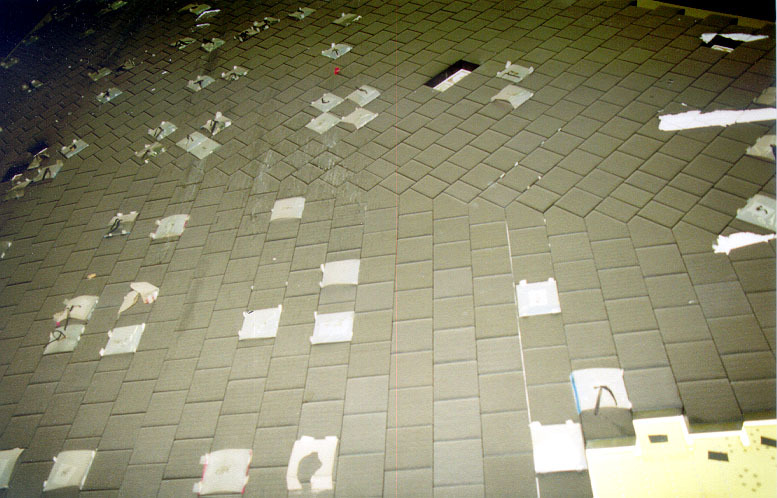 This organization of the tiles makes it possible to reduce aerodynamic turbulences during the flight. As for the nasal part, the elevons and the drift, the tiles are positioned according to a range. For the change of direction of the joints lines pentagonal tiles are introduced, because they do not have acute angles. 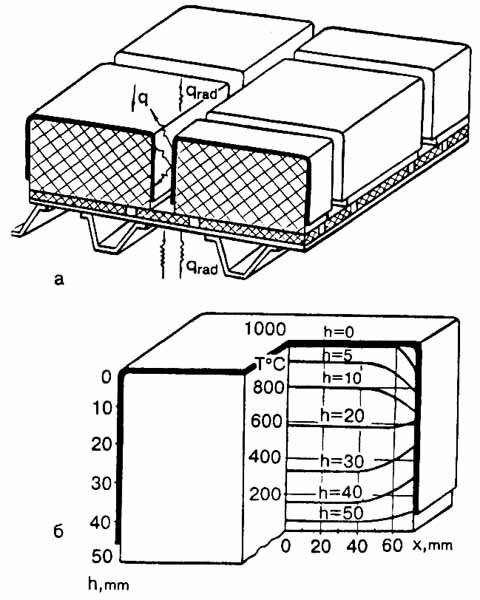 The whole the heat shield consists of 38600 tiles (38800 from other sources), 15% of them are irregular or particularly complex (drained, chamfered, etc). 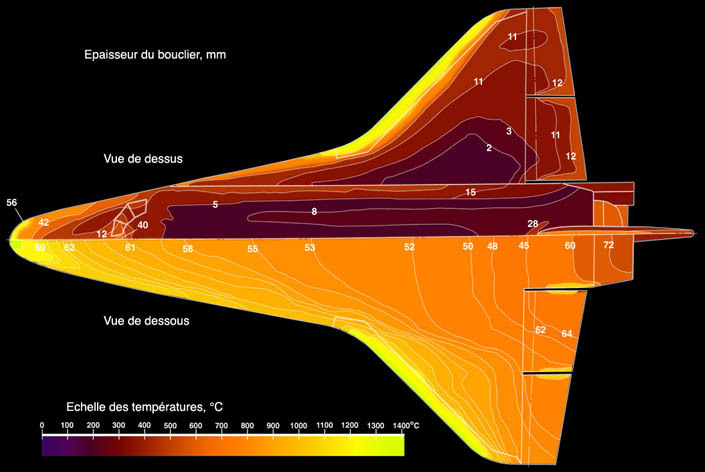 The hottest parts of the fuselage are the nose and the leading edge of the wings. This zone is protected by silicon dioxyde fibre ceramic tiles. The port-holes of the cockpit can heat until 750°C. To guarantee a good heat insulation the port-hole is made of 2 layers, one is a double glazing, as you can see it on the drawing. In the zones where the temperature is less high, an organic fibrous matters is used.